Learn Excel at your own pace and focus on what you need to know for your own particular job, with a personalized online Excel Course, available on your laptop, tablet or phone 24/7. This course is CPD certified by the CPD Standards office. 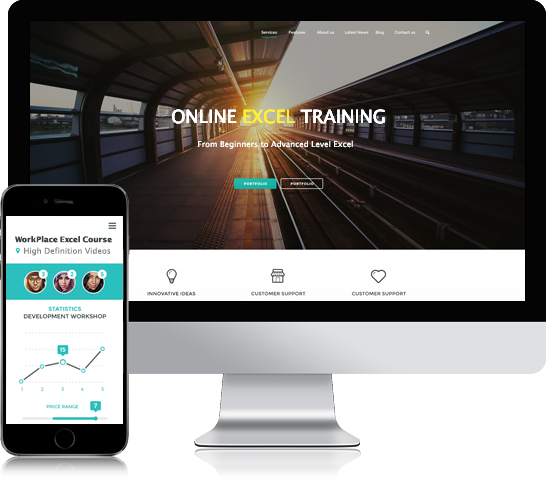 Our Online Excel course gives you access to all the modules -Beginners, Intermediate, Advanced and Pivot Tables with over 12 hours of Video Tutorials in high definition video & sound. Our experienced tutors have over 30 years of Excel training and development experience between them. Live chat and email support from your tutor will be available for you for any help you may require until you reach your Excel Goals. Like the above modules this is another essential module you need to master, especially if your work in Excel involves analyzing large chunks of data. 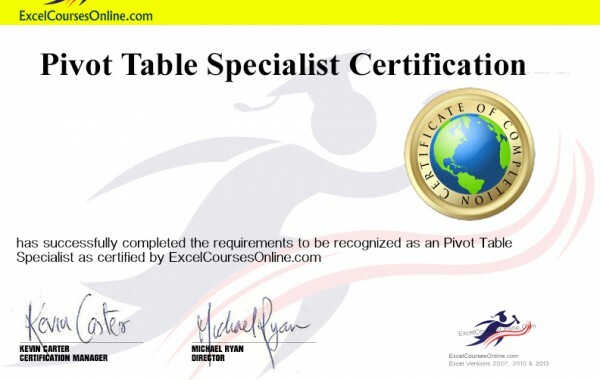 What is an Excel Table ?. How to create and use them and how they differ from ordinary lists and Named ranges. Error Types explained and How to handle them? Imagine I asked you to look up 100 phone numbers in a paper-based phone book? What would you do? Firstly, you would notice that the book was sorted alphabetically , you would then search for the name and when you found it , you would move your eyes over the relevant record until you found the telephone number. INDEX & MATCH Functions: Dynamic control over all your Data. Pivot data is quiet volatile and it is quite difficult to grab data from pivot tables for further analysis. We will show in this module a possible solution to this problem whereby we can populated per-formated reports from our live Pivot Tables. What Level of Excel do I need to start the course? Our course start at beginner level – so you don’t need any existing knowledge of Excel. The course will then bring you up to advanced Level. How long does it take to complete each section. Please see the diagram on the left which shows video lengths and estimated study times to pass each section. You will get access to the whole course for one year. Do you provide support during the course? Yes, unlike most other online Excel courses, we provide email support for any Excel questions you might have as you study the course. What Format is the course delivered in ? Our Course is delivered online via our website. The courses are accessed when you login to your account. 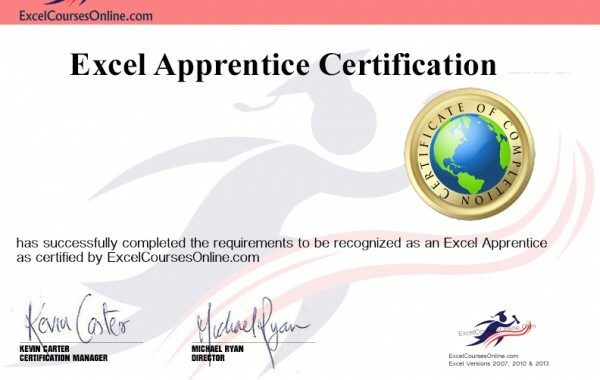 The Course materials take the form of Online videos and downloadable Excel exercises to practice what you have learned. Can I access the course from more than one computer? Yes you can. our Whether its your desktop at work or your own personal laptop, table or Smartphone, you can access your course from all of them. What software does the course require ? Well, Excel of course, in order to practice what you are learning. The course videos and downloads can be accessed using free software that most computers will have had installed for everyday internet usage like mp3 player. Do I get a certificate for each level ? Yes, once you have completed the beginner level,the intermediate level and the advanced level , we will provide you with a Certificate of Completion. This indicates that you have completed the course and the assessment attached with the course. After completing the level and its assessment, you can automatically output your certificate of Completion. Is payment on your site secure ? Yes. Payments are 100% secured with SSL. Secure payments are powered by PayPal, the largest payment service in the world, used by millions of businesses and individuals worldwide. How soon can I start the course after payment ? Straight away. Just click the LOGIN button at the top right of the website, enter your username and the password you chose. You can start learning immediately. Can I get a refund if I am not happy ? Yes, we offer no questions asked full refund within 30 days of purchase. The above illustration gives an indication of the time required to master each Level. There are 4 levels of certification available in this course. The certificate will be produced automatically with your name and details after you have achieved 80% or over in your test for each Level. You can do the Pivot Table test alone without doing the previous tests. The exams comprise of 10 to 15 task questions which test your understanding of the modules you have studied. You can repeat these tests. It will award 10 CPU points.